Managing sustainably and profitably in a highly variable climate is a major challenge for northern beef producers. The Wambiana grazing trial started in 1997 to test and develop sustainable and profitable strategies to manage for rainfall variability in extensive grazing lands. The trial is located on the property Wambiana near Charters Towers, Queensland, and consists of 10 paddocks – each 100 hectares in size. Grazing strategies tested during the first phase from 1997 to 2010 included moderate set-stocking, heavy set-stocking, rotational wet-season spelling, and two variable stocking strategies. This first phase provided the first experimental evidence clearly linking moderate stocking to sustained productivity and improved profitability over the medium term. Loss of land condition under heavy stocking compromised productivity, profitability and the local environment. The trial clearly demonstrated the productive benefits of improved grazing management, in a manner and scale of direct relevance to the grazing industry of northern Australia. 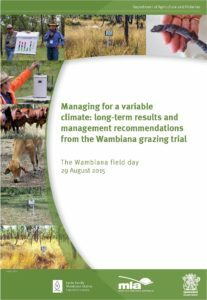 For more information download a copy of Managing for a variable climate: long-term results and management recommendations from the Wambiana grazing trial (PDF, 9MB). Read more about Grazing land management. To learn about a Wambiana study, investigating the effects of fire on managing currant bush, read the ABC Rural report Firing up the currant bush. As presented at the Northern Beef Research Update Conference 2013, Peter O’Reagain (Principal Scientist, Department of Agriculture and Fisheries) discusses 16 years of grazing research at the Wambiana grazing trial. Peter’s discussion includes the implementation of different stocking rates, cattle production, seasonal challenges, economic challenges and their impacts on overall productivity and profitability. 26:49 minutes published 31 March 2014 by FutureBeefAu. In this webinar, Trevor Hall (Principal Scientist, Department of Agriculture and Fisheries) talks about the effects of rotational and cell grazing systems on the condition and productivity of pastures in northern Australia. The presentation draws on an evaluation of contrasting grazing systems (continuous, rotational, cell) on each of nine Queensland properties, located from Condamine in the south to Richmond in the north. 54:18 minutes published 1 December 2011 by FutureBeefAu.